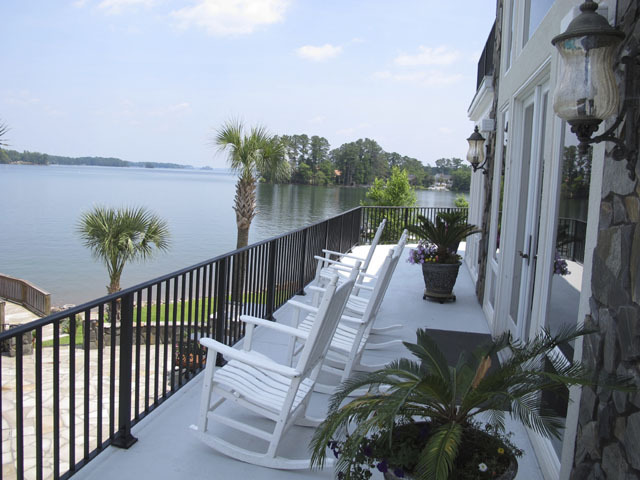 This amenity-rich Lake Murray home is perfect for entertaining family and friends. At the end of a peninsula, overlooking a particularly beautiful view of Lake Murray, sits the home of Tim and Lisa Hofferth. They bought the house eleven years ago and immediately began to put their own creative touches throughout the interior and exterior of their home. The attention to detail is extraordinary and they continue to update here and there, and adapt the space to their changing family dynamics. The result is beautiful, elegant, inviting and family friendly which is all by design for a home that, by turns, has entertained South Carolina’s governor, and varied business and personal social events, as well as hosted sleepovers and parties for their four children and friends. Today, Oliver, the rescue dog, follows us around as we enjoy each room and its furnishings. Lisa volunteers her time at Pawmetto Lifeline and is passionate about the plight of homeless dogs and cats in the Midlands. She is a strong advocate for adopting rescue animals, and Oliver is a walking advertisement for the joys these animals can bring. Their three older children are mostly out of the home. Joshua is a Columbia Police Officer, who is currently attending the Police Academy, Megan is a junior at USC, and Jacob is a freshman at USC. Lilly Grace, six, is at school today. When I met Lisa and Tim Hofferth seven years ago, the family had made the decision to adopt a baby girl from China and their names were on the list for adoption (a process that would take several years before they got the word to head to Beijing and meet their baby). It’s no easy task to create an environment that is as comfortable welcoming business leaders as it is inviting kids over to watch a movie, but this home succeeds admirably. When the Hofferths moved in, they redid the original kitchen and installed Indian Gold granite countertops and slate floors. Cabinetmaker and artisan Jim McGrew added gorgeous wood accents, including faux boxes, finials, crown molding, and much more, resulting in a kitchen that is inviting, elegant and incredibly functional for all ages. Recently, after a trip to Turks and Caicos, Tim returned home on a mission. “The home we stayed in had a fantastic Miele coffee center and I was determined to find a way to incorporate that into our kitchen.” An unused wet bar in the living room gave way to the new kitchen coffee nook, fashioned by Jim McGrew. The walls were redone with a plaster finish, and cabinets painted to incorporate the new colors of the coffee nook were beautifully done by local artisan Mary Ann Haven. It looks as if it were built with the original home. In the living room, the Hofferths wanted a new design for their fireplace and brought back one of their stone masons, Corley Turner. Corley and his brother Rob had spent six months creating stonework columns and elements around the pool, including a stone water feature that bubbles into Lake Murray. For their newest update, Corley was asked to enlarge their fireplace and cover it with stone, rising up about twenty-five feet to the ceiling. On each side of the massive stone pillar, art and sculpture treasures are showcased to perfection. “Mary Ellen Ringer at Material Things helped to create the living room and dining room curtains. She has also been great in helping me choose pieces that speak to us and reflect our family,” Lisa explained. Overhead, the metal railing linking the bedrooms is an intricate piece of art, designed by noted metal artist Robert Sadlemire. Known for his ability to blend form and function, the railing is another spectacular sculpture that also serves to keep everyone safe as they admire the view. There’s another focal point along the upstairs walkway that offers a glimpse into the strong family heritage the Indiana natives brought to their relationship. The wall’s initial focus is on a silk screen of the "Nativity" created by Lisa's father in 1960. This scene holds great pride for Lisa and was the inspiration for her wall. On the left side of a large family photo gallery, Lisa's family portraits exhibit weddings and childhood pictures of parents and grandparents from long ago. The other side of the wall features Tim's family, with grandparents’ wedding portraits, parents and grandparent’s childhood pictures, and a picture of Tim proudly posing for his 1982 NJCAA Championship baseball team. In the dining room, Lisa points out one of her special treasures, a one-of-a-kind painting by Columbia artist Mary Ann Haven. The abstract is a swirl of burgundy, highlighting colors in the room and providing a very appealing focal point for dinner guests. "Mary Ann is so imaginative and artistically talented. It was amazing to watch her move from the imagination it took to recreate my kitchen colors and textures, to creating this lovely piece of unique art." Upstairs, Lilly’s room is fit for a princess, with her special treasures and lots of pink, of course. On the wall, a lovely water color tells the story of Chinese workers in the fields. Lisa found the painting in Blowing Rock, created by an artist with connections to China. Lilly is fascinated by the artwork, and doubtless will learn more as she grows older. The outside Lanai and pool area is picture-perfect for parties, grilling in the outdoor kitchen, or simply lounging around the pool. A boat lift holds their watercraft and a jet ski is ready for instant play on the lake. So what does the future hold? Helping to complete the launch of their older children, lots more soccer games and piano lessons with Lilly, and long walks with Oliver. The Hofferths will celebrate their 30th wedding anniversary with a trip to Italy in May. Their agenda will always allow for more tweaking of this house and their mountain home in Blowing Rock. After selling Tim's sports marketing company, there will be another corporate venture in the coming year. Lots of love and laughter will follow them along the way. “We have been blessed and we are so very grateful,” Lisa said with a smile.